While the book itself is one I'm eagerly anticipating, the cover doesn't do much for me. 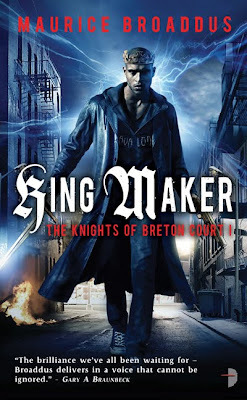 I like the King Maker font but the Knights of Breton Court subtitle is off center and bugs me to no end. Anyone who reads my Covering Covers pieces also knows I'm not a fan of photorealistic characters on my covers. I'm not sure if its the fact that they interfere with my own mental image of the characters but they just don't feel right. This general design also evokes bad Urban Fantasy covers, which I don't care for. Angry Robot is always trying new things with their covers and while some of them aren't great they are at least trying to give each book its own unique look. King Maker comes out in the UK in March 2010 and the US in September. I've got a few questions though. 1. Do foreign readers enjoy/understand the geography of America? Does setting the story in Indianapolis rather than Dallas or Nashville mean anything to UK audiences? 2. Why are publishers unwilling to put more stylistic covers on genre works? Why can we only get characters, cityscapes, or spaceships? 3. What do you think of this cover? Firstly, I LOVE this cover. I think the art work is amazing and I would buy the book just for that! But reading the synopsis as well makes me think that this is a book I would really enjoy. Secondly, I'm from the UK and I read lots of books with different geographical backdrops. It's interesting to read about different places, and if the writer is good, then I will get an essence of the place they are writing about. Thirdly, I love the fact a book has a cover that reflects the story. If it's a science fiction book I like a science fiction cover etc. Of course, this isn't to say that anything will do. It still has to be top notch artwork etc. 1) Does the cover necessarily reflect the story? I guess if there is a man with a sword in it then it does. The off-center text really ticks me off. 2) But does Indianapolis mean anything to you? It just seems like an atypical setting to me, particularly when the first audience will be foreign readers. 3) I agree that the synopsis sounds great. And while I judge covers, it doesn't [well most of the time] keep me from reading them. 1) I am a US reader so I don't know how it will play for no US readers. From a US perspective though I do get somewhat tired of everything being set in NYC or Dallas or LA or one of the other "big times cities." 2) Covers = shrug. Unfortunately covers are more a marketing ploy than anything else, I will be happy when I get an eReader and don't really have to see covers. 3) That being said, this cover isn't too bad. I think it captures the synopsis pretty well and it certainly wouldn't detract from me purchasing the novel. 1) I like this cover, although it makes me think the book should also come with some kind of soundtrack... which isn't necessarily a bad thing. But I agree -- if, in the story, the guy doesn't have a sword, then the cover won't make sense. Kind of like an urban fantasy cover featuring a woman with a tattoo --- and then in the book, she doesn't have any tattoo at all. 2) I live in the US, but I enjoy reading books set in other places, even if I haven't traveled there, myself. If I have been to a particular place, it lends an extra dimension to the story for me, because I have a little connection to it. 3) And a final comment about the cover. I like that you can see all of him. He has a head. There seem to be an awful lot of urban fantasy books featuring women (usually posed looking over a back shoulder), who don't have a complete head. While I understand that this could allow a reader to allow their imagination to fill in the blanks, I'm starting to find it tiresome that women can't have a complete head. I too love the cover and I am from the UK! I'm not sure why Angry Robot are "pioneering" it in the UK - except maybe we have fewer racists per capita? (Despite the efforts of one Mr Nick Griffin.) There are certainly books for kids over here with multiethnic portrayals on the cover. I've heard about the cover "race rows" you've had in the US. thumbs down to 'em! I like this cover because it is very clear and definite and unapologetic. I'm tired of the umpteen UK and worldwide bestsellers I've seen with boring covers. "The Da Vinci Code" a case in point! Loved the book: but every cover I saw for it was vague and dull! Say cityscapes? Headless people? You'd be lucky (over here!) Most cover designs, eg for Dan Brown, are more like kind of logos or very abstract symbols or one picked-out small detail. *Very* rarely anything with any artistic flair. Or if it is striking, it's stylized/semi-abstract. Stephenie Meyer's UK covers and the "adult" ones for J K Rowling come to mind. Philip Pullman's covers too. On Northern Lights. Were boring by the time I got around to buying them. I suppose the rule of thumb to be: the bigger the bestseller, the more boring and "generic" must be the cover. I don't read that much urban fantasy so I'm not so jaded as you spoiled Americans. I only know the big names: Gaiman, Miéville. Perdido St Station had a cityscape on the paperback cover: very striking, but kinda abstract-y - no people! Monsters, or anything! (I wished they'd used some of the fan artwork that's popped up on gaming sites: much more imaginative!) What's the point of a city without life? Me I like characters on covers; I like large figures, and I like detail! Angry Robot oblige! (One thing I don't like is dingy backgrounds; but in this circumstance one is understandable!) Full-length,face-on figures are good, sword or sans sword. Can't see about off-centre lettering: it's not if you count it all as part of a single logo. Funny story: d'you know what the first 60s (bootleg) edition of Tolkien's Hobbit pictured? Emus!